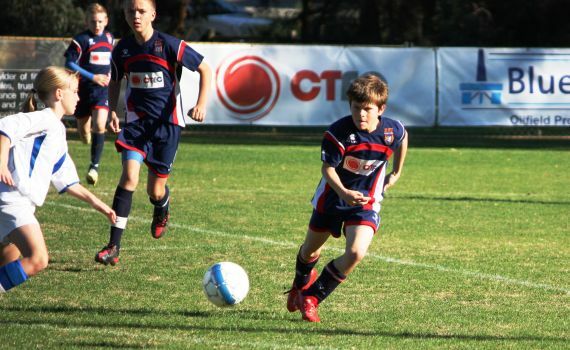 ECU under 12’s came from behind to defeat league leaders Perth in a tight and enthralling contest. Coming off the back of a disappointing performance in the drawn game last week, ECU stepped up a gear and deserved their win against a good footballing Perth team. Both sides created opportunities early on, Perth were very quick on the break and the home team constantly got in behind the Perth defence down the flanks, only to see a series of good crosses come to nothing. Midway through the half, the away team were ahead, a long range effort by the Perth player beating ECU keeper, Ed Cook, and giving the league leaders a 1-0 lead. Back came ECU, a couple of decent shots by Harley Curran went wide and Declan Hudson’s shot was fumbled by the away keeper and appeared to cross the line but the goal was not given. ECU played with much more purpose in the second half, having changed their shape a little to get more of the ball in midfield and set up a period of pressure on the Perth goal. The pressure paid off as the home side grabbed a deserved equaliser, from a corner, the away defence only partially cleared the ball to Harley on the edge of the area and from a slight angle. Harley adjusted his body position well and drilled his shot into the roof of the net. ECU were now playing the better football but Perth were still dangerous on the break and had a couple of near misses half way through the half. A couple more decent crosses came in from ECU, James Lawless working hard on the right hand side and Liam Hudson dangerous on the left. It was looking like a score draw would be the final score when the home side were awarded a free kick on the right wing. Harley whipped in a good cross, the away defence did not clear the ball properly and it fell to midfielder Oliver Ford on the edge of the area, he steadied himself and fired in an unstoppable shot into the roof of the net, much to the delight of his team mates and fans alike. The final whistle went almost immediately and the home side celebrated a very good win over a very good side, but one they deserved as ECU were the side going forward for most of the second half.